UWE Bristol hosted a discussion with stakeholders and Universities Minister Sam Gyimah on how to build on the higher education sector's approach to student mental health and wellbeing. The round-table discussion brought together universities, national bodies, charities, students and local leaders to discuss how they can work together to improve provision for students. It followed an announcement by the Minister of a new charter, created by leading charities and higher education bodies, which will outline criteria that universities need to meet to gain the recognition. Student Minds, the UK's student mental health charity, will lead a partnership of organisations in the development of the charter. Partners will include the UPP Foundation, Office for Students (OfS), National Union of Students (NUS) and Universities UK. 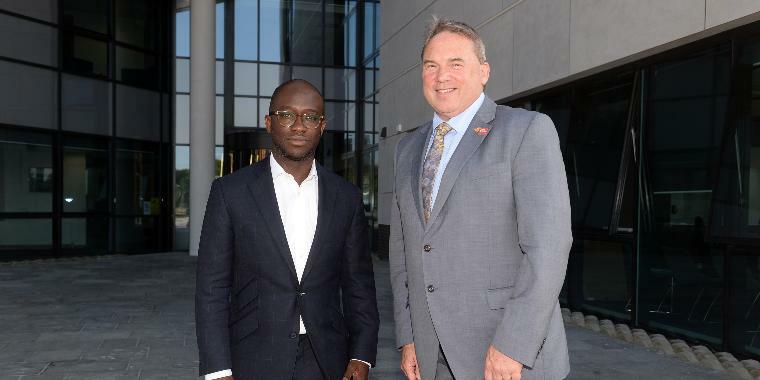 Universities Minister Sam Gyimah said: "We want mental health support for students to be a top priority for the leadership of all our universities. Progress can only be achieved with the support of the leadership of our autonomous universities – I expect them to get behind this important agenda as we otherwise risk failing an entire generation of students. The charter's development, which is supported by a £100,000 grant to Student Minds from the UPP Foundation, the registered charity founded by University Partnerships Programme (UPP), will recognise and reward those institutions that demonstrate making student and staff mental health a university-wide priority and deliver improved student mental health and wellbeing outcomes. The Charter programme will build on recent guidance, including the University UK's #StepChange framework encouraging leaders to take a whole-university approach in improving mental health services. Professor Steve West, UWE Bristol Vice-Chancellor and chair of the Universities UK Mental Health in Higher Education advisory group, said: “Increasingly mental health is being seen as a priority in our universities. That is why many are now implementing the Stepchange framework. It is designed to encourage university leaders to take a whole university approach to this issue by making mental health a strategic priority and a core part of all university activities. “New initiatives which are aligned with, and build upon, the work of Stepchange have an important role to play. The new Student Minds charter will help recognise best practice at universities that are leading the way. “Universities cannot address these complex challenges alone. Partnership working with students, staff, government, schools, colleges and employers, the NHS, local authorities and third sector organisations is vital if we are to help students and staff to thrive. Rosie Tressler, CEO of Student Minds, said: “As the Minister has recognised today, there is much work to be done to ensure that institutions make mental health a strategic priority, supporting the 1 in 4 students and staff experiencing mental ill health and the 4 in 4 with mental health, at universities across the UK. “Student Minds are delighted to have the support of the UPP Foundation and our partners to co-create the University Mental Health Charter with students, and university and health communities. This programme will stretch and reward universities that commit to the improvement required, providing tools and support to help them get there. f) Reduce inequality by ensuring the needs of all students are met by excellent services, including BAME, LGBTQ+, and widening participation population groups. UWE Bristol (the University of the West of England) has approximately 30,000 students. The University has strong industry networks and connections with over 1,000 employers as well as a global and inclusive outlook. Research at UWE Bristol focuses on real world problems and the University plays a pivotal role in the regional economy. With over £300 million invested in infrastructure, buildings and facilities across all Campuses, UWE Bristol is creating a place for learning that is innovative, ambitious, connected, enabling and inclusive.